The Black Sea Region Turkey is the least known tourist destination we promote, it is unspoilt, rural, traditional and well worth exploring. 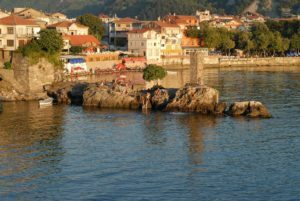 The Kackar Mountains provide a stunning backdrop and places such as Amasra, Rize and Trabzon, pretty seaside towns that retain lots of character. The Black Sea Coast has a higher rainfall average than the rest of Turkey and so is very lush and green, it is a prolific tea and nut growing region, particularly hazlenuts . The region is also ideally suited to travelers with a keen interest in history and culture. There are many early Christian sites and ancient trade routes to explore. There are some wonderful buildings such as Sumela Monastery, built into a cliff face and decorated in religious murals. Description: We have organised a 6 day, self drive tour of The Black Sea region. Dates and times are flexible, we recommend March through to October months to visit the area. Accommodation is a range of quality hotels and traditional guesthouses. Includes: 7 nights accommodation, with Turkish breakfasts, airport transfers to and from hotel, our recommendation list & detailed itinerary. Optional: Private guide at € 60 per day, per person, minimum two people. Airport Details: Trabzon Airport. We are happy to assist with flight arrangements on request. Accom Type: A selection of hand-picked, “boutique” character hotels and traditional guesthouses, all with ensuite bathroom facilities. Notes: Contact us for advice on internal flights & further information. If you have any questions about The Black Sea Region Turkey, our itineraries or would like further information please contact us at info@bespoketurkey.com or fill in our booking form. We look forward to hearing from you.